Last Tuesday was Election Day, and there were some things to be happy about. Certainly, one is the fact that Massachusetts voters opted to allow the Affordable Housing Law to stay on the books. That legislation has allowed the Church and many other non-profit organizations to do a great deal to remedy the housing shortage for low and moderate-income families. I am also very pleased a pro-life Catholic, John Boehner from Ohio, is expected to be the new Speaker of the House. We hope that the pro-life voice will be heard, and that more and more pro-life people will see the field of politics as a vocation for them to be able to defend the Gospel of Life. The challenges are only going to continue to increase. We do not want people to retreat from the field, so we’re very glad when pro-life Catholics make the sacrifices that are necessary to embrace a life of politics. It’s very hard on an individual and their family, but we hope our Catholic community will help identify those people and support them. This week, we also had the good news of the dedication of the new seminary in Havana, San Carlos and San Ambrosio, on Wednesday. I was disappointed I was not able to be present for the dedication. I was there when they began the project about 10 years ago because I was a visitator to the seminaries at the time. I also had a chance to see the progress of the construction when I visited Cuba last year. They have a beautiful piece of land just outside the city. 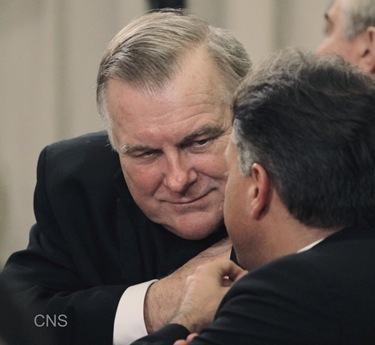 We’re very grateful to Frank Ward, whose generosity provided the Archdiocese of Havana with money to buy the land and start-up money to build the seminary. 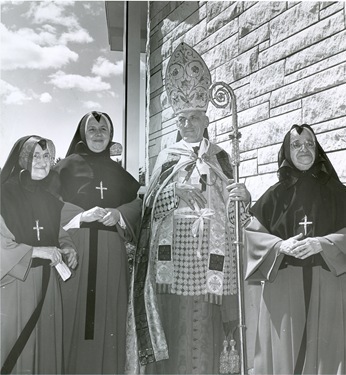 Since then, they have received more funds from the Knights of Columbus, but without the very generous help of Frank Ward, the seminary would not be a reality today. It has taken them about 10 years to build it because it’s so difficult to get permissions, materials and equipment. 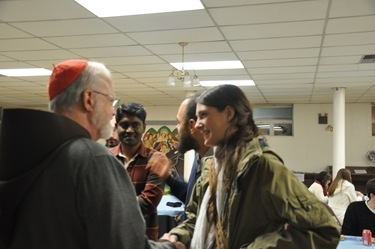 Archbishop Wenski, of Miami, and Carl Anderson, the Supreme Knight of the Knights of Columbus, were among those who were able to be present on this very happy occasion. 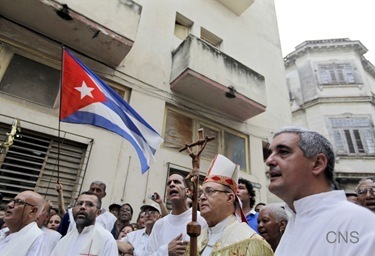 The Church in Cuba faces many challenges, but certainly the opening of the seminary is a great sign of hope for the people of Cuba and a cause for rejoicing in the Church throughout the world. 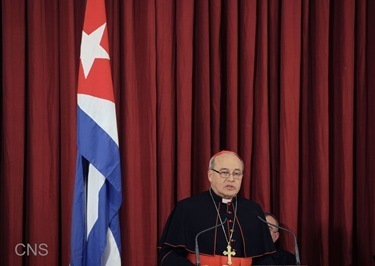 We congratulate Cardinal Ortega and all those who have worked so hard and persevered in this long endeavor that has come to fruition now. Now, for the events of my week. On Thursday, I was visited by officials from the Catholic Leadership Institute, and they updated me on some of their very important work. We’re so grateful for the work that they do and the excellent leadership training they give to so many of our pastors, Good Leaders, Good Shepherds. We are about to start another session of that program here in the archdiocese. 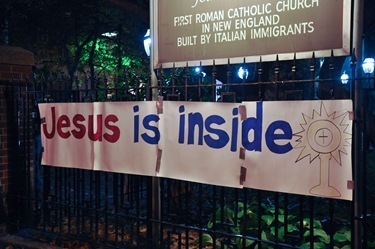 I spent Friday evening with our young adults at their monthly gathering, Jesus in the North End. 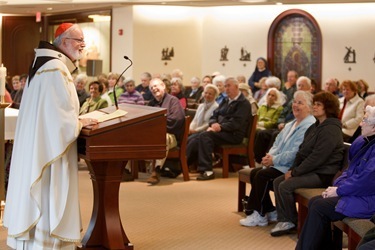 Once per month, they gather for a Holy Hour and Mass at St. Leonard’s, and then gather for a meal. They always try to hold a meeting close to Halloween. 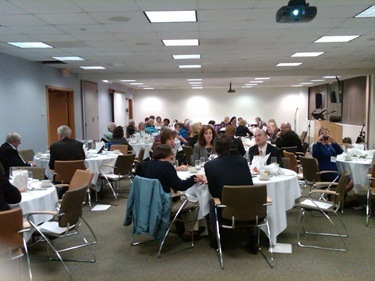 As always, we had a wonderful turnout of college students and young adults. 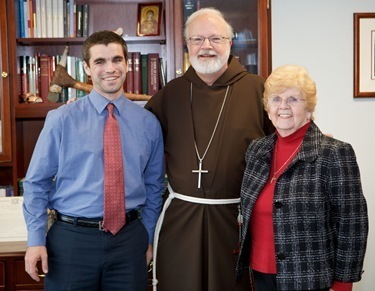 We’re so grateful to Father Matt Williams and his office and the support they get from the Vocations Office. 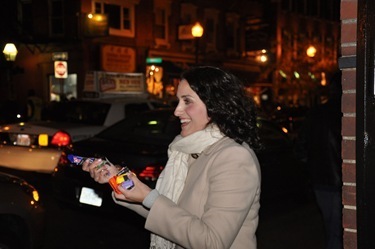 One of the reasons we’ve gone to the North End is because it’s such a popular place for people to go and have dinner. There are always people walking on the street to go to a coffee shop or get an Italian meal or pastry. 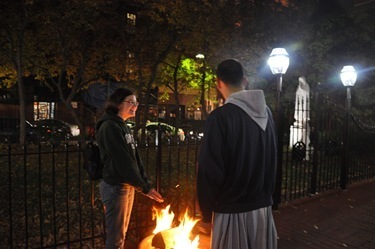 The young people always invite passersby to join us. They come in and are very happy to pray with us. 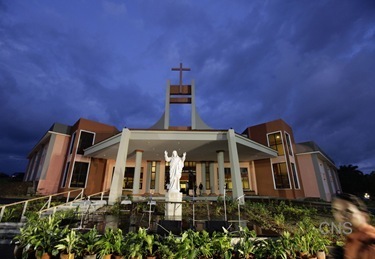 St. Leonard’s is also a particularly inviting church, with a peace garden in front of it. On Saturday morning, I had a Mass of Profession for a new archdiocesan hermit. Hermits are those who take vows of poverty, chastity and obedience, and live according to a rule of life, but in the world. It’s almost like being a religious in a community of one, with a special commitment to the contemplative aspect of prayer and also a life of service to the larger community. We were very pleased that Judith DeCampo, after a long period of discernment and preparation, made her profession at the Cathedral last Saturday. 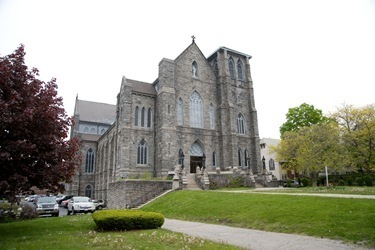 I spent Saturday evening in Lowell, where I celebrated Mass at Immaculate Conception Parish. 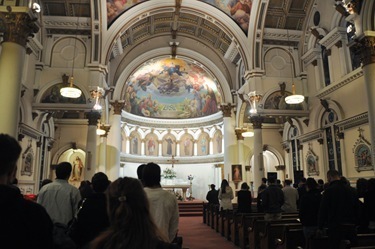 The vigil Mass at Immaculate Conception was in the lower church, since they are in the process of renovating the upper church. 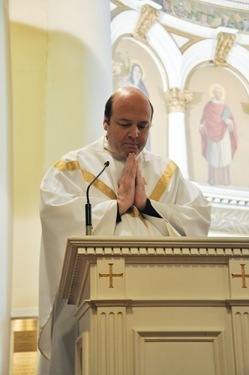 Father Nick Sannella is doing an extraordinary job in that parish. The church is a cathedral-like structure, a real monument and landmark in Lowell, and he has been working very hard to restore the church. We look forward to going back for the rededication of the upper church. They had a wonderful children’s choir at Saturday’s Mass made up of children from the parish school as well as the CCD program. They sang beautifully. 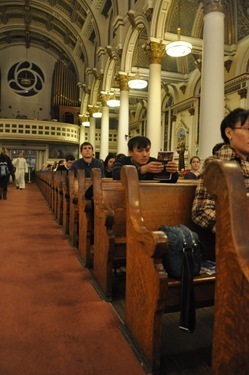 We had a very full church with a lot of enthusiasm. The people have obvious great affection for their pastor and the wonderful job he is doing. 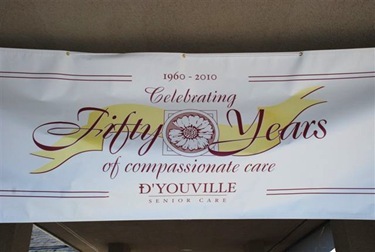 From there, we went to the 50th anniversary celebration of D’Youville Senior Care, also in Lowell. 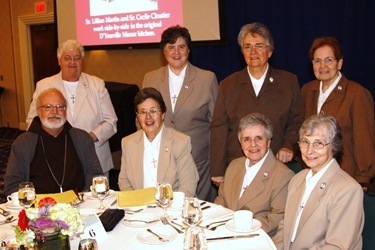 It was a great celebration of the work of Sisters of Charity of Ottawa. They have been in the archdiocese for over 100 years. 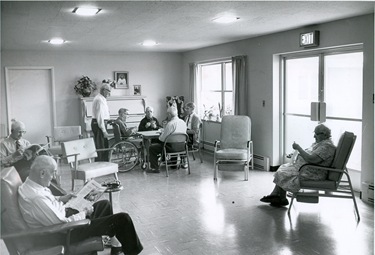 We have some wonderful photos in our archives of when the facility was just preparing to open and of the original dedication. 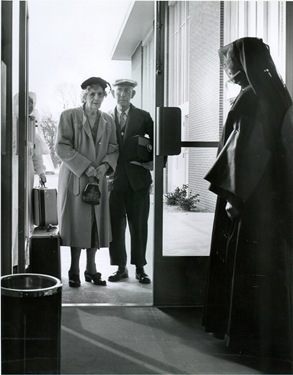 Sister Prescille Malo, besides her involvement in health care and elderly care, is principal of Ste. 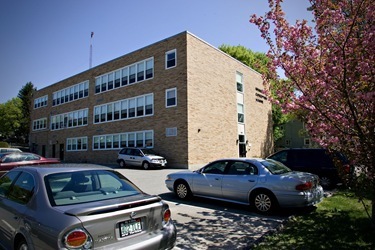 Jeanne d’Arc School, which recently won a Blue Ribbon Award from the U.S. Department of Education for the outstanding education they provide their students. 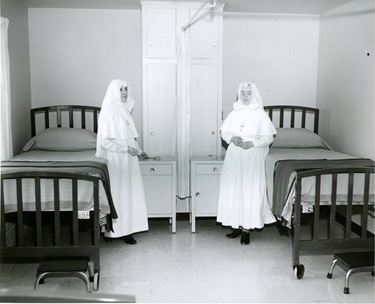 The Grey Nuns are few in number here in the archdiocese, but their presence is mightily felt! We were very happy to be with them. During the diner after the Mass I had a chance to talk with the provincial, Sister Pauline Leblanc. She had worked for about ten years in Papua New Guinea, and knows my classmates over there. 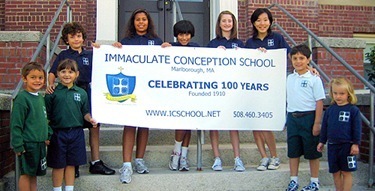 On Sunday, I had a Mass, and visited the parish school, at Immaculate Conception in Marlboro. 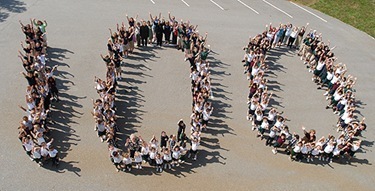 The parish is much older than the school, but the school is celebrating its 100th anniversary this year. 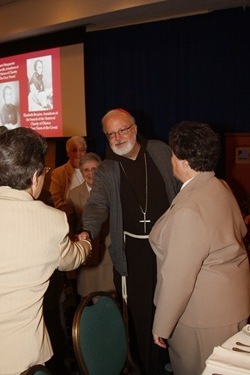 The people, of course, were all very happy to see Father Jonathan Gaspar, who served there before he became my priest secretary. It’s a parish that has a large Hispanic and Brazilian population, and has a beautiful church and school. 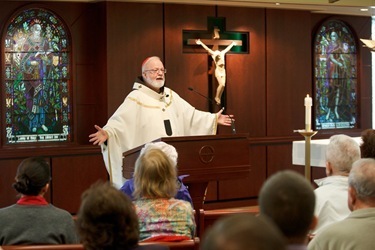 Father Michael MacEwen is an extraordinary pastoral leader in the parish. The people are very supportive of him. This last year he celebrated his 25th anniversary, so at the Mass we presented him with a Papal blessing to commemorate his 25th anniversary as a priest. 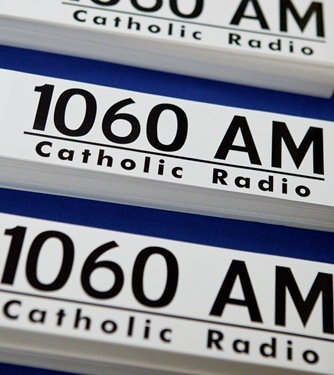 On Monday, the Solemnity of All Saints, we gathered in the morning at the cathedral to celebrate the inaugural broadcast of the first full-time Catholic radio station in the Boston area, WQOM 1060 AM. 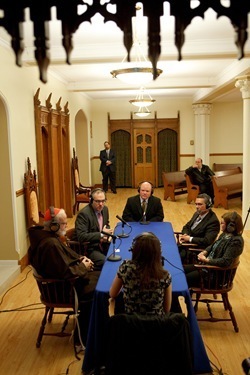 I said a Mass that morning in the lower church of the Cathedral to open the station, which was followed by a brief interview with Scot Landry, who is our Secretary for Catholic Media, EWTN President Michael Warsaw, Jim Wright, who is the president of Holy Family Communications, which runs the station, WQOM General Manager Maria Bain, and me. 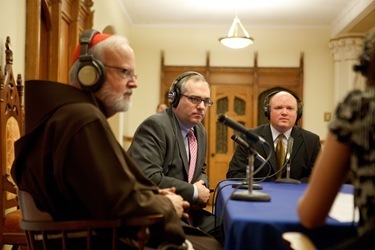 Ten years ago, the station’s founders visited Mother Angelica’s station and became inspired to get into the radio ministry. Since then, they have founded a number of stations. They do this certainly as a ministry, and they have their own jobs. We’re very grateful for the investment they have made to come here and buy a radio station. Surely, it will be a wonderful resource for us and we encourage all of our Catholic people to support them. 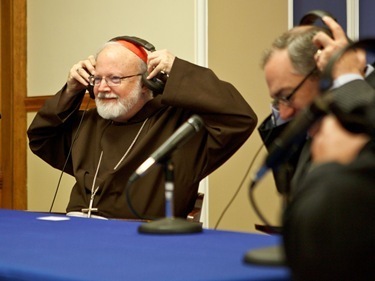 Please know it will be a wonderful opportunity of outreach to the larger community and to Catholics who do not have much contact with the Church because radio reaches a lot of people at home, in their cars and at work. 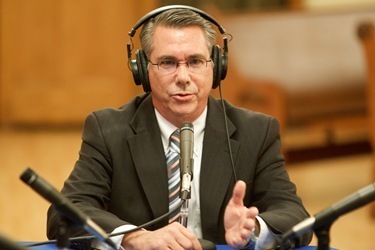 We look forward to building local participation in the radio station. 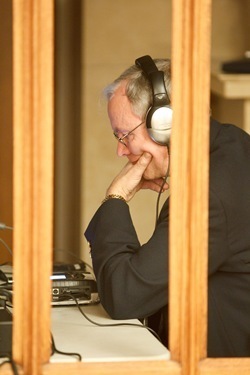 For example, they will broadcast the daily Mass from CatholicTV, and we hope to have more and more local programming as time goes on. 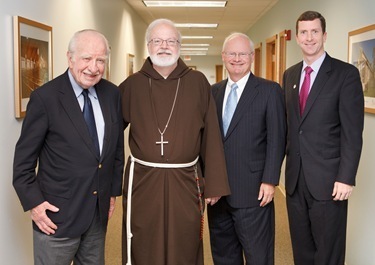 I am grateful to Scot Landry and his team in our Catholic media secretariat for their hard work and leadership in bringing this important evangelization tool to the Boston area. Of course the following day was All Souls Day, which is one of the two days of the year when a priest is allowed to celebrate three Masses. 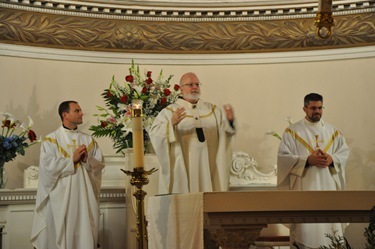 Obviously, there are many occasions when a priest, because of pastoral necessity, must celebrate multiple Masses. 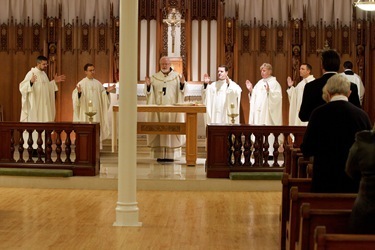 However, on two days of the year, All Souls and Christmas, a priest, even if he’s alone, can celebrate three Masses. I celebrated the mid-day Mass at the Pastoral Center and I celebrated my other two Masses at the Cathedral. I think that underscores the important doctrine of prayers for the dead. In fact, we never celebrate a Mass without commemoration for the dead. In November, we honor all of our saints in heaven, whether they are famous or anonymous. As I always say, these feasts are like the Tomb of the Unknown Soldier. We may not know them by name, but we know that they are there. We pray, too for all of our beloved dead, those who are already in heaven and those who are in via, so that our prayers can accompany them and prepare them for the purification they need to enjoy the beatific vision. So, it’s always very comforting for me to see how many people do come to Mass this day. It’s a tradition we need to pass on to our young people and make sure they understand that it is a very beautiful way of seeing the Church, the Body of Christ. 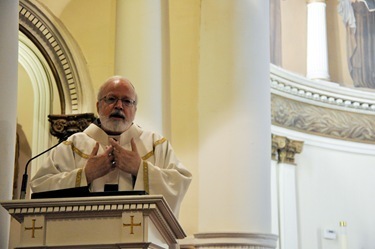 That is, not just the people in our own parishes — or even the people who are living today — but that the Body of Christ is throughout the world and those who have passed into eternity and are living forever. Someday we will follow them on the same path. 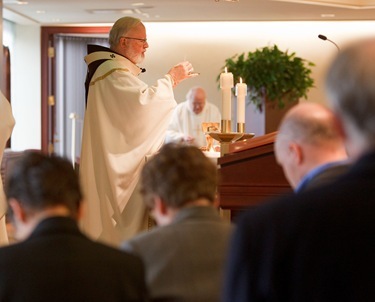 Just as we are praying for the souls now, in the future other faithful Catholics will be praying for us. On Wednesday afternoon I was pleased to visit with Nannette Canniff, the President and CEO of the St. Boniface Haiti Foundation and Conor Shapiro, the Director General. Nannette has been directly involved with relief efforts in Fond des Blancs, in rural Haiti, for more than 25 years and Conor has been involved for almost 10 years. 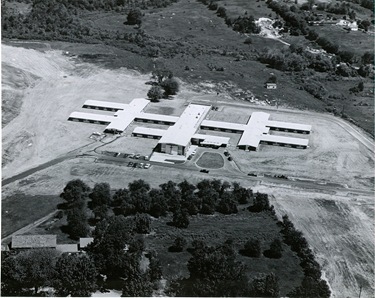 The Foundation oversees a full-service hospital, which is the only source of healthcare for a population of 250,000 rural poor, and also sponsors education and community development initiatives. 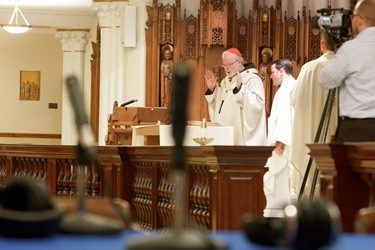 Their dedication and commitment, and that of all who assist them, is a blessing for the Church. 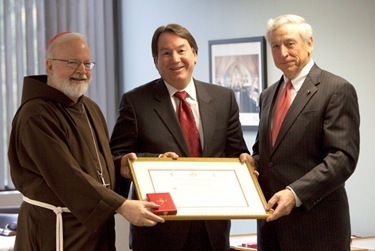 Recalling the recent luncheon held at the Pastoral Center to honor members of the Order of Malta, who have accomplished so much at Hospital Sacre Couer in Haiti, I want to share with you an additional photo, of Steven Rusckowski, President of Philips Healthcare Global, receiving an award from Mr. Joseph Miller, President of the American Association of the Order of Malta. Through Mr. Rusckowski’s efforts Philips Healthcare provided a significant amount of medical technology equipment for the hospital, allowing them to care for patients in ways they had not been able to previously. Steven and his wife Deborah have been steadfast supporters of the Order’s work in Haiti and have gone to Hospital Sacre Couer on many occasions to volunteer their time and effort. 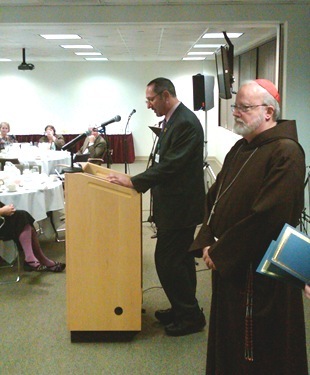 Also on Wednesday, I attended the Chaplain Awards Dinner here at the Pastoral Center. 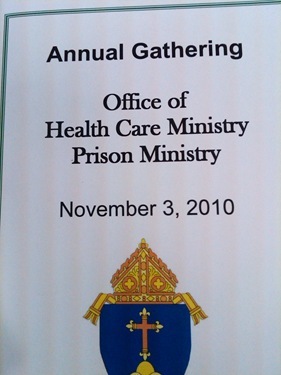 As I told the chaplains, I congratulated them because they have a wonderful job. 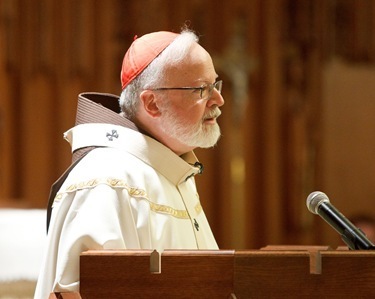 It may not be the best remunerated job, but they are able to be the face of the merciful Christ and the Catholic community to people in their greatest moments of suffering, loss and pain. It’s a job that has many challenges, but is so important for the mission of the Church. The entire Church owes a debt of gratitude to our chaplains who do this work day-in and day-out in our prisons, nursing homes and hospitals. Many of them have been doing it so generously and joyfully for many years. 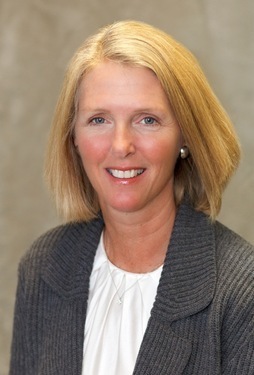 Finally, this week we were happy to announce that Kathleen Driscoll will be joining our staff here at the Pastoral Center as our Secretary for Institutional Advancement and Chief Development Officer. 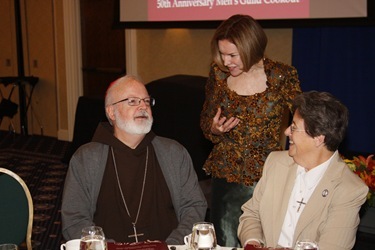 She has recently been involved in raising millions of dollars for our Catholic schools as the president of the Campaign for Catholic Schools, and was a co-chair for our last clergy dinner, a fundraiser that brought in $1 million for our retired priests. She has also been a member of the Board of Directors of Catholic Charities. She is the mother of six children, and she has a beautiful Catholic family. She certainly brings a lot of talent, commitment, and a very deep faith to her job. We’re very delighted to have her on board.